There is a very good chance that this fight will still take place. It’s been over a year-and-a-half since we last saw former world champion Amir Khan inside of a boxing ring. In May of 2016, Khan was brutally stopped by Mexican superstar Saul “Canelo” Alvarez in the sixth round of their pay per view match from the T-Mobile Arena. Khan, regardless of whether he is active or not, is one of the biggest draws in the sport and he just recently made headlines by announcing that he will be returning in 2018 with promoter Eddie Hearn guiding his career. Khan does have some options that appear to be on the table for his return, include former champion Antonio DeMarco, tough contender Adrian Granados, very capable Josesito Lopez, and come-backing Sammy Vasquez. But none of those names thus far have appeared to generate any kind of interest from the fans. There was some serious buzz going on around the net about Khan possibly facing Adrien Broner next, but that too has died down a bit. Khan, as quoted in a recent SkySports.com article, has listed some future opponents he would like to one day face. Check below to see the list, plus our thoughts. Keith Thurman – WBA/WBC welterweight champion Keith Thurman and Khan have traded several words with one another in the media over the years and this is a stylistic matchup that would likely end in fireworks. Thurman is rangy yet powerful with his punches, while Khan’s speed and movement could give “One Time” a look he has yet to see before. Either way, a big subplot heading in would be whether or not Amir Khan’s chin could stand up to Thurman’s power. Errol Spence Jr. – Spence is one of the sport’s emerging champions and he proved his worth with his gritty destruction of Kell Brook this past May. If Spence can get past former champion Lamont Peterson on January 20, he stands as a very formidable foe for Amir. Spence has a patient, stalking style that allows him to overwhelm his foes and his body attack is one of the best in the game. Khan would likely have his hands full with a fighter like Spence a this point but he shouldn’t be overlooked himself either. Terence Crawford – Terence Crawford likely will be facing off with WBO welterweight champion Jeff Horn on April 21 and Khan has mentioned him on his hit list. Crawford is one of the game’s top fighters and it will be fascinating to see how he fares in his new weight class. Him vs. Khan definitely would be fun. Manny Pacquiao – Khan used to train alongside and often spar with eight-division world champion Manny Pacquiao, so each man knows the other very well. Khan cut ties with Hall-of-Fame trainer Freddie Roach years back and now trains under Virgil Hunter. Him and Pacquiao have both expressed interest in the fight and it honestly seems like it’s up to the promoters whether or not this happens. Pacquiao has been promoted by Top Rank for several years. 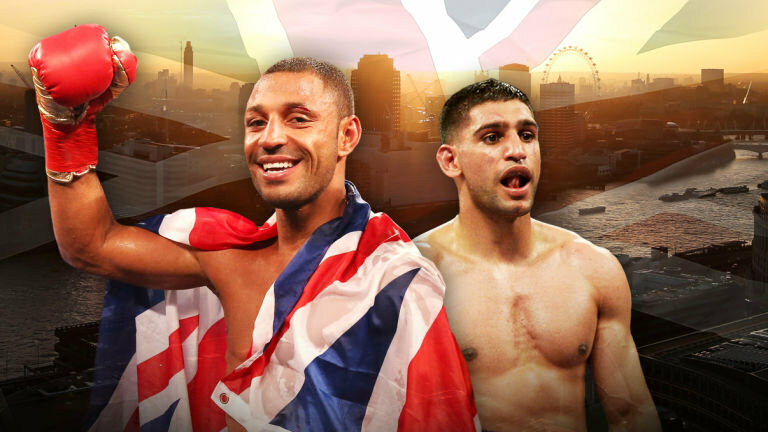 Kell Brook – Yet another potential high-profile fight that Khan has mentioned is one against countryman Kell Brook, the former IBF welterweight champion of the world. Brook lost his title to Spence, but still remains a very viable threat at 147-154 pounds. Him and Khan makes sense and now that they are both aligned with Hearn, this one very well could be coming off.